I'm Shamsydar, a 19-year-old undergrad from Singapore. I've began wearing the hijab full-time a year ago after my A-Levels, because public schools here in Singapore require uniforms to be donned. Though I was unable to wear the hijab to school, I wore it when I wasn't in my school uniform. Now, I love the option of being able to dress up to school even with a hijab on. Although I don't think I have a distinct style of my own, my friends would know it was me if they saw a hijabi on the street with sneakers. I wear everything with sneakers, Vans being my favourite as they are comfortable and trendy. I rarely wear heels out even if I have a dress on, because comfort to me is more important than being fashionable. It is not a pleasant sight to see a well-dressed hijabi limping around because of her uncomfortable shoes. Apart from comfort, I emphasise on colours. I think it is important to dress colourfully because colours influence your moods and feelings. Feeling awesome and looking great will certainly boost your confidence. When choosing the right hijab colour for your outfit, look out for the prints on your outfit. For example, if you have on a black abaya with pink embellishments, put on a pink hijab to complement the outfit. It is also recommended to have on a printed hijab with a plain outfit, and vice versa. I usually get my outfit inspirations from fashion magazines like TeenVogue, Seventeen as well as from TV shows like Gossip Girl and 90210. I then source out for outfits at Topshop, Dorothy Perkins and OldNavy.com during the sale period because prices are slashed for up to 70 percent. Sometimes, I find cheap steals at flea markets and that would save me a ton of money as well. Here in Singapore, there are many shops that cater to Muslimahs and hijabis from which I buy underscarves and hijabs selling at less than $10 each. Colours, colours, colours and more colours! Non-hijabis wear their hair differently every day, but hair colour remains the same for a few months. Hijabis have the advantage of changing their 'hair' colour almost everyday! 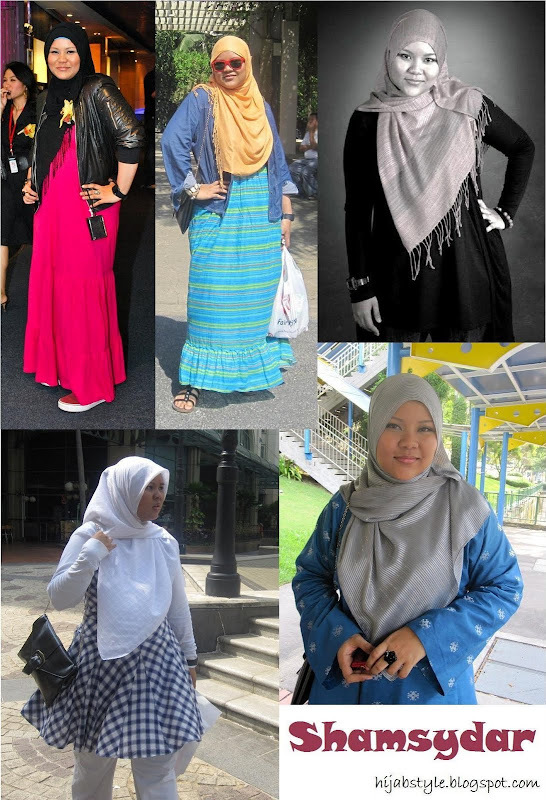 Colours are definitely important for plus-sized hijabis like myself, because colours boost your self-esteem and confidence level. The only black thing in my wardrobe are my abayas, which I wear with coloured hijabs. Accessories are also important to me. Bracelets, rings and bangles jazz up a dull outfit anytime so it is great to have a few in your jewelery box. Invest in a good-quality bag because it will last you longer. I really appreciate her chest coverage, because I am a curvy girl too. I love her syle and she is beautiful as well masha'allah! i love your confidence with colours....and you are NOT plus size btw!! Masya Allah! I like her style, especially how she wrapped her hijab. I think she looks great and is obviously comfortable in her clothes as well as fashion conscious. She is a testiment to muslim women everywhere who want to stay traditional but still look fantastic. That black and white top is so cute. she looks fab!!! Very similar to my own style! I think i need to go shopping with u sister! Mashallah. I LOVE the hijab style. It has lots of chest coverage and yet so chic. I need to know exactly how you wrap your hijab. perfect example on how to "hijab style" love it!! I have a question. Are muslim women allowed to wear flip flopsor other open shoes or do they have to cover up their feet? Shamsydar is beautiful and has great style :D it's refreshing to see opinions from a plus size hijabi! Your pink outfit is absolutely gorgeous btw - talk about trendy!